Ford has made an excellent impression with its top of the line F-150, with the pick-up truck coming with aluminum body, and not the conventional steel bodywork being put of a standard pick-up. It seems that the F-150 will not be the only one coming with aluminum, as Ford is reported to come with other aluminum versions, like the Expedition model. It wouldn’t be a surprise for an aluminum Expedition model, since the present model is actually based on the F-150 chassis. 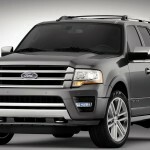 More than that, the Ford automaker is also considering putting on some lightweight materials for the Explorer model. Besides the Expedition, the Explorer model will be also getting an aluminum body, and since these would be major changes, we might expect the pick-up truck not coming very soon. And here we go on with a logical explanation about the next-gen of the Navigator that is also expected to come lighter due to aluminum body parts. With these plans ahead, Ford is trying to get rid of the carbon emissions and come with solutions for a better fuel-efficiency on a market that is affected by an economic crises.